I was easily ensconced in the solving of these three murders – dead bodies discovered in different rooms of the same London hotel, each with a monogrammed cufflink placed in their mouths. The murders take place in 1929, although the motive proceeds from events 16 years earlier. Poirot is in good form – and a comforting element – as he slowly unravels each clue, commenting in French phrases. The plot is as intricate and as puzzling as a Christie mystery, and Hannah manages to replicate the old-fashioned style and Poirot’s egotistical manner. And yet, the story seems to go longer than I remember Christie doing, and the aha element seems a little lacking at the end. 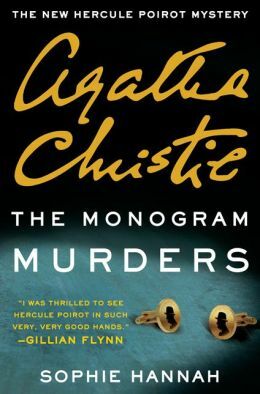 Christie always managed to tie up all the loose ends in a final chapter, succinctly and quickly, but Hannah’s resolution meanders until you are wondering if Poirot will ever explain. Still a good detective story, The Monogram Murders may be more Hannah than Christie, with a visiting Poirot as a bonus. After exhaustive searches of trip advisor and downloaded tips from Fodor, Frommer, and Rick Steves, I needed a little fiction to sustain me on my trip. Since Scotland is on my itinerary, Diane Gabaldon’s Outlander series and a friend’s suggestion – Mary Stewart’s The Stormy Petrel – will be good starts. I may bring my trainers and mimic The Unlikely Pilgrimage of Harold Fry across Hadrian’s Wall and through the Cotswolds, and the new Maggie Hope mystery will be a great companion in London. I hope to find a Peter May mystery in a bookstore, and maybe Sophie Hannah’s new resurrection of Agatha Christie’s Poirot in The Monogram Murders, but I have an old Jane Gardam paperback with me just in case.